ComputerWorld runs two stories this week which illustrate a point/counterpoint, albeit unintentionally. The medical data that might have saved me several hours of terror sat unused. It was unavailable to doctors outside of Dartmouth-Hitchcock's Keene clinic, except by mail or fax. And even if the clinic could transmit my records, Charlotte Regional Medical Center's systems were incapable of receiving them. According to its records department, the hospital still uses paper-based processes for its medical records. University of Miami officials last week acknowledged that six backup tapes from its medical school that contained more than 2 million medical records was stolen in March from a van that was transporting the data to an off-site facility. Perhaps someone in the know weighs the chances of a faulty diagnosis against the chances of the data being stolen and determined the risk of theft is greater. Perhaps not. But that's a consideration to make, ainna? Today, we hit a couple of garage sales nearby. We did not come home empty-handed. 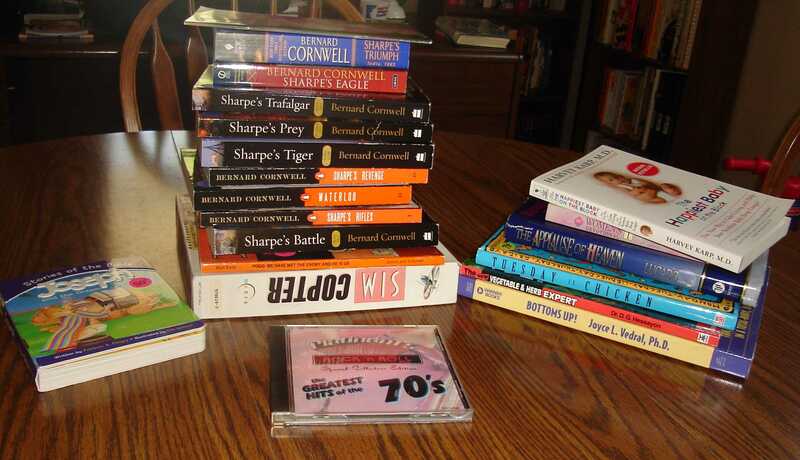 9 volumes (of 11, apparently) of Bernard Cornwell's Sharpe series of historical novels. I don't think I've heard of them. However, they were fifty cents each, and if I like them, I have a lot of them. If I don't, well, I hope my heirs like them or get similar value for them. A thin reference volume on using perennials in landscaping. A collection of Pogo cartoons that I can read while watching a baseball game. Additionally, I bought a CD of hits of the 70s and SimCopter. And a really nice Renoir print; I spotted it even though the signature was covered by the matting of the print. It was marked $4, but the garage sale proprietor and owner of a Lustron house offered to give it to me for $3, even after I had $4 out. I like when negotiations go like that. My beautiful wife didn't like the frame, but we found another of the same size that she liked at another sale. Providence, I tell you. So that's 11 books for me, total, which is more than I've read this week, so I better get onto a couple more quick browsing books. Now, this is an idea book (unlike this). This volume collects 11 essays about real criminal cases, written by famous (or semi-famous, or at least published) authors of suspense or crime fiction. Most of the cases were sensational in the day, but time and probably O.J. have erased them from our minds. As such, they're worth a bit of exploration from decades later and retelling. The book also includes a science fantasy story by Harlan Ellison about Jack the Ripper, which is out of place. A pretty enjoyable read, although as one Amazon reviewer notes, some things go on too long, including a recap of the Snyder-Gray trial in 1927 and Erle Stanley Gardner's explication of Argosy magazine's "The Court of Last Resort" series. But still worth the time, I'd say, especially if you can score a copy cheap, such as one cent plus fifteen dollars shipping and handling through the convenient link below. I grabbed this book because I owned it and because I've gotten into the new good habit of looking at these browseable books while I'm watching a baseball game instead of leafing through a magazine or trying to get into something of my denser, deeper reading between pitches. This book, apparently dating from the 1960s (it's not dated inside, but Amazon or its users says 1969), so who am I to argue? It looks to be a companion to a museum exhibit or two. It contains a brief (30-40 pages of text?) biographical sketch of Michelangelo and images of his work. It explores his movement in Renaissance Italy and the trends in his work. Interesting stuff, particularly since I was not that familiar with his time period or whatnot. Coupled with my other recent read of Renaissance Italy (John Hawkwood: An English Mercenary in Fourteenth-Century Italy), I'm getting more familiar with this pivotal period in history and whatnot. Interesting bonus factoid/intersection: Less than 100 years after Hawkwood was chief of Florentine defenses, Michelangelo took at turn at the walls, literally, as he was the Governor General of fortifications and lent himself to constructing the walls and whatnot. Interesting, and something one can browse during a televised baseball game. Culture and Cardinals baseball are going to be the hallmarks of my summer. An anonymous commenter proffers an informed argument that pitbulls and their owners are genetically defective and should be euthanized in a comment to this three year-old post. You meet the nicest people as the result of Google search results, don't you? The St. Louis Cardinals' ninth inning pitcher, commonly called the closer, bears the name Isringhausen and the nickname "Izzy." I so move that the nickname be revised hereby to "Izzy Or Izzn'ty." 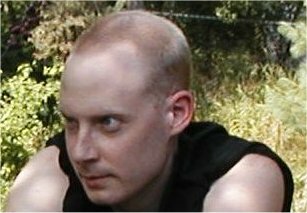 Once, when I was young, a young lady to whom I was rather attracted told me I looked sinister. I took it as a compliment. Explains a bit about how well I got on with the young ladies. The St. Louis County Council on Tuesday rejected a measure to scrap a controversial plan to divide unincorporated areas into trash collection districts that would each be served by one waste hauler. The vote at the council's regular meeting followed two hours of fervent public comments at a special hearing Tuesday afternoon. In their arguments before the council, numerous county residents raised such diverse points as the need to preserve the free market economy and worries about the durability of asphalt. The bill, proposed by Councilman John Campisi, R-south St. Louis County, would have removed the county's authority to establish the trash districts. The contract for waste hauling in each district is to be awarded to the lowest bidder. Campisi said that the districts were unpopular with his constituents and that he feared they would put small haulers out of business. His bill failed 4-3 on a party line vote, with Democratic council members Kathleen Burkett, Hazel Erby, Barbara Fraser and Mike O'Mara voting against it and Republicans Greg Quinn and Colleen Wasinger joining Campisi in support of it. You know, it used to be government made a set of commandments you shouldn't break as laws. The thou shalt nots: Don't murder anyone, don't collect piles of disease- and rodent-bearing refuse on your property. Then it became a bunch of laws designed to keep people out of circumstances where the citizens could possibly commit a thou shalt not: Thou shalt not have guns, thou shalt have weekly garbage pick up. Now, it's gone beyond that, removing even more choice by limiting the citizens' behavior to well-conceived courses designated by the governments. The thou shalts: Thou shalt use Waste Management for your weekly mandatory garbage pickups and your weekly mandatory recycling garbage pickups. Thou shalt paint your house only in colors approved by the historical preservation committee. And so on. Where does it end? It should have ended with the thou shalt nots; now, there's no principle preventing the city and county councils from mandating any behavior for the good of the municipality. The third of three men charged in a illegal turtle-napping scheme pleaded guilty in St. Louis today to a federal felony charge. Bobby Wayne Pyburn, 20, admitted that he and Erich Wayne Higgins, 33, had set up nets and illegally trapped dozens of turtles late last summer in Missouri's bootheel and sold them to Kenneth Brandon Reese, 26, in Arkansas. All of the men are from Lake City, Ark., the U.S. Attorney's office said. -Napping tends to refer to either the illegal capture of people or, less formally, pets. However, by applying it to wild animals instead of the more precise term for the crime that already exists, the journalist and writer are elevating the wild turtles to the same legal status as humans or human possessions. Think I'm making too much of this? Well, try this analogy on for size. Poaching:-Napping::Hunting::Murdering. In both cases, the gerund for an act involving wildlife is replaced with a legal term dealing with crimes against men to elevate your outrage at the lesser charge by making it sound like violence against man. I received this book as a Christmas gift. It provided a couple hours of browsing while watching baseball, as it's that sort of book: a number of Top 10 lists about various and sundry subject grouped into categories like music and sports and leisure. Definitely a coffeetable/browsing sort of book, as there's not much text besides the lists, the sources, and the occasional tidbit. The first chapters on science and nature didn't really hook me, as I really have little interest in the top animals by size or the most common or uncommon elements. Once we moved into to the entertainment sections, though, I could get through more of them in a sitting. Probably not worth the amount it's going for on Amazon, but it was a gift. If you're looking for lists, you're probably better off with The Book of Lists series, which offers more interesting lists with better commentary/detail on the list items. Noggle on driveways today, but it still pales compared to the achievements of others. Ignoring lobbying from a major Republican campaign donor, the House voted overwhelmingly Monday to grant the largest tax break ever in Missouri to a Canadian firm. With little debate, legislators approved a package aimed at luring Montreal-based Bombardier Aerospace to build a $375 million plant near Kansas City International Airport. The bipartisan vote was 125-16. The bill now moves to the Senate. Bombardier could draw up to $40 million a year for 22 years, as could other "mega-projects" that invest at least $300 million and employ 1,000 people at above-average wages. Critics, led by multimillionaire Rex Sinquefield of St. Louis, have questioned whether the state would get its money back. His free-market think tank, the Show-Me Institute, recommends the state give tax breaks to everyone instead of picking projects to promote. The paper uses lobbying as a negatively laden code word these days which means "sought government attention." The fact that he often gives to Republicans is also a code that he's a fat cat. In short, the Post-Dispatch tries to marginalize the person's views, which are that the state shouldn't engage in crony capitalism and give breaks to its friends or to projects its legislators like. A good principle, but not one to even consider when it comes from a wealthy Republican lobbyist. A tax scheduled to end? Stop! Milwaukee Mayor Tom Barrett and two local law enforcement officials want telephone users to help pay for police, firefighters and paramedics through their phone bills. Barrett, Milwaukee County District Attorney John Chisholm and Police Chief Edward Flynn are asking Gov. Jim Doyle and the Legislature to give municipalities control over the 911 telephone surcharge that is supposed to expire Nov. 30. They're hoping to add that provision to the budget-repair bill now under consideration. The surcharge on cellular telephone users was created in 2005 to cover the costs of technology to pinpoint the locations of cell phones during calls to the 911 emergency number. Montgomery said that technology has saved at least 15 lives statewide. The fee started at 83 cents a month, rose to 92 cents in 2006 and then dropped this year to 43 cents. In the sidebar, the mayor as quoted as saying, "Gun crime is expensive, and fighting crime is expensive." Gee, mayor, how about some prioritization? Pick either gun crime or fighting crime then, instead of making taxpayers of your (formerly) fair city pay for everything you can dream of in your power-mad dreams?